Who doesn’t love a good gyro? I know I sure do and boy have I been missing gyros and authentic Greek food in general since I moved down south. Back home I was spoiled with an abundance of great Greek dining options (including my Dad’s cooking, lol) and am sure to get my fix whenever I visit, however, since the closest Greek restaurant that I know of locally is about an hour away, I’m always needing to find ways to get my Greek fix at home via my own recipes. TIP: If you buy in bulk this is a great money-saving meal to get rid of your freezer stock of ground beef! Beef not your thangg? No problem, just substitute ground turkey or chicken. Step 1: In a large skillet, heat olive oil and add diced onion. Cook onion until it just begins to soften (about 4 minutes or so) then add garlic and cook for about 2 more minutes. Step 2: To the onion and garlic add ground beef, using a wooden spoon to break it into small pieces and cook until it is no longer pink. Drain any liquid from pan and return pan to stove. Step 3: To the meat mixture add oregano, cumin, pepper, salt, marjoram, rosemary and thyme and allow to cook for about 3-4 minutes longer, stirring constantly. Step 4: Heat pitas in a skillet or in a pre-heated oven for a few minutes (this is optional, pitas do not need to be heated I just enjoy mine that way). Taking one pita at a time, spread about 3 tablespoons of tzatziki on each (depending on how much you like) then topping with ground beef, lettuce, tomato and finally a bit of feta. Cut into quarters and enjoy! These make great leftovers! 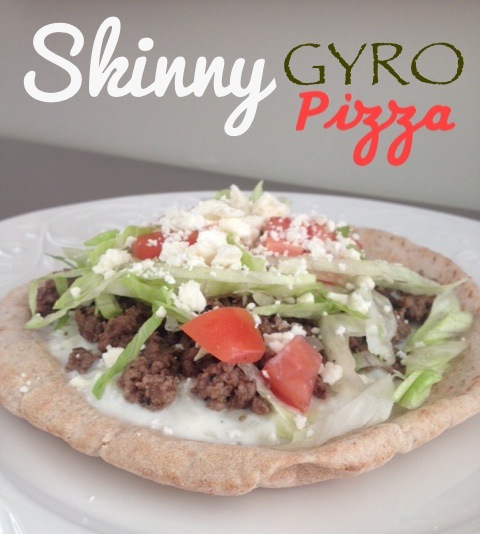 Another fun take on this might be “gyro tacos”, using the pita in place of the tortilla.